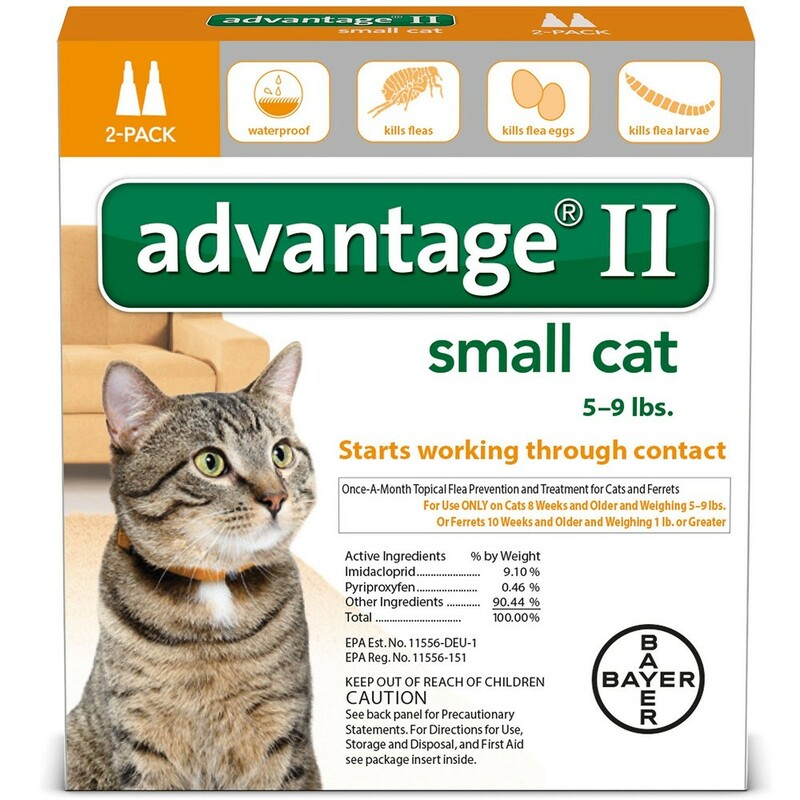 Advantage II Flea Control for Small Cats help protect your furry friend from parasitic pests and the potentially harmful diseases they can transmit with Advantage II Flea Treatment for Small Cats & Ferrets. This highly-effective, veterinarian-recommended treatment is specifically formulated to kill all life stages of fleas on contact with no painful biting required. With three-way protection that kills the eggs, larvae and adults, it breaks the flea life-cycle to help prevent re-infestation of your pet and your home. The waterproof formula continues working for up to four weeks, even after bathing; for use on kittens and cats 8 weeks or older and weighing between 5 and 9 pounds, as well as ferrets 10 weeks or older and weighing 1 pound or more. Veterinarian-recommended treatment kills fleas cats 8 weeks or older and weighing 5-9 pounds, as well as ferrets 10 weeks or older and weighing 1 pound or more. Begins working within 12 hours to kill fleas on contact with no painful biting required. Kills eggs, larvae and adult fleas to break the life-cycle and help prevent re-infestation. Convenient, monthly topical application contains imidacloprid and pyriproxyfen; available in packs of 2, 4 or 6 treatments. Part the hair on the neck at the base of the skull until the skin is visible. Place the tip of the tube on the skin and squeeze the tube to expel the entire contents directly on the skin. Do not get this product in your cat’s eyes, or allow your cat to ingest this product. The product is bitter tasting and salivation may occur for a short time if the cat licks the product immediately after treatment. Treatment at the base of the skull will minimize the opportunity for the cat to lick the product. Do not allow the product to run off. Under normal conditions this product is effective for a month. However, in cases of severe flea infestation, retreatment may be necessary earlier than four (4) weeks. Do not retreat more often than once every fourteen (14) days for kittens or once every seven (7) days for small and large cats. After flea control is attained, return to a monthly retreatment schedule. Use only on cats or kittens 8 weeks and older. Do not apply to cats or kittens weighing less than 9 lbs. Do not use on other animals. Do not apply more than one (1) tube per treatment, even for larger cats. For external use only. Do not apply to cats or kittens 8 weeks of age or weighing less than 9 lbs. As with any product, consult your veterinarian before using this product on debilitated, aged, pregnant or nursing cats. Individual sensitivities, while rare, may occur after using ANY pesticide product for cats. If signs persist, or become more severe, consult a veterinarian immediately. If your cat is on medication, consult your veterinarian before using this or any other product. Side Effects: Monitor your cat after application. Side effects, although very rare, may include signs of skin irritation such as redness, scratching, or other signs of discomfort. Gastrointestinal signs such as hypersalivation, vomiting or diarrhea have also been reported. If these or other side effects (such as lethargy) occur, consult your veterinarian or call 1-800-422-9874.